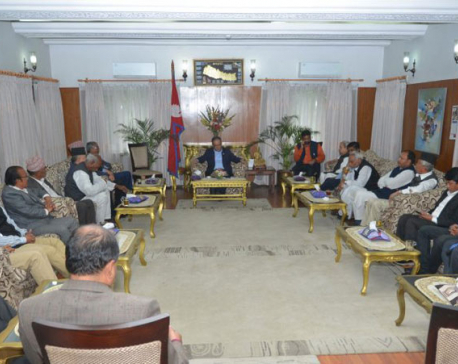 KATHMANDU, Feb 14: The participation of ministers representing Rastriya Janata Party Nepal (RJPN) in the Province 2 cabinet scheduled to be formed on Thursday has become uncertain after serious intra-party differences cropped up within the RJPN over the power sharing deal. The differences over the selection of ministers surfaced after RJPN presidium member Raj Kishor Yadav and Anil Jha objected to the proposal of two other presidium members, Mahantha Thakur and Mahendra Raya Yadav, to send only those elected under the First-Past-the-Post (FPTP) electoral system to the cabinet. Two other presidium members, Rajendra Mahato and Sharat Singh Bhandari, remained neutral on the proposal of Thakur and Yadav. According to senior RJPN leaders, the participation of the party in the new cabinet in Province 2 on Thursday is less likely as the party leadership is mulling over not sending any candidates to the cabinet until the intra-party differences are resolved. "The reason Anil Jha and Raj Kishor Yadav are protesting against the proposal is that they do not have even a single provincial assembly member closer to them elected under the FPTP system," the leader said, asking not to be named. Earlier, the Upendra Yadav-led Federal Socialist Forum Nepal (FSFN) and RJPN inked a deal to form a coalition government in Province 2. While the FSFN will take key portfolios including chief minister, deputy speaker and three important ministries: the Ministry of Finance, Ministry of Social Security and Welfare and Ministry of Agriculture, the RJPN will have house speaker and three ministries: the Ministry of Physical Planning and Development, Ministry of Social Development and Ministry of Tourism as per the agreement. As per the agreement, the FSFN has already named Mohammad Lal Babu Raut as the chief ministerial candidate and RJPN has named Saroj Yadav as the provincial assembly speaker candidate. FSFN leaders said ministers from their party will take the oath of office and secrecy on Thursday itself.